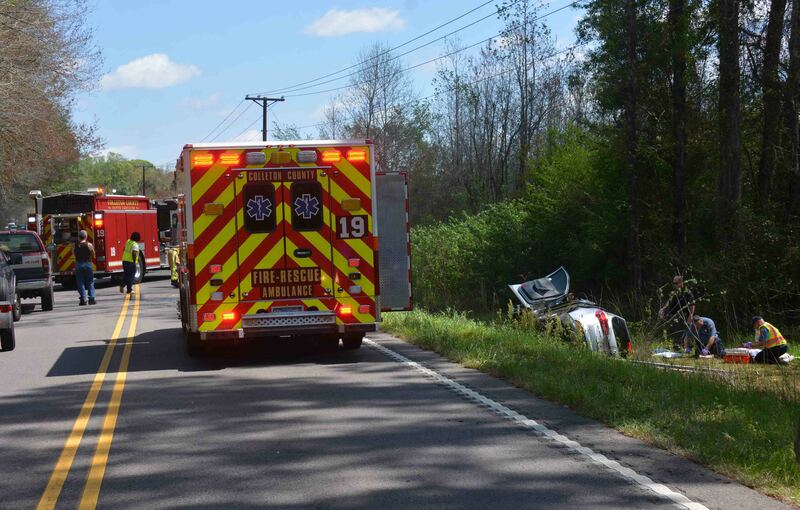 A head-on collision in the 4900 block of Cottageville Hwy (US Hwy 17-A) sent two adult females to a Trauma Center Monday afternoon 28-March at 12:38. Engine 19 arrived to find two vehicles with heavy damage, one in the roadway and the other laying on its side in the ditch. The vehicles had been traveling in opposite directions and collided in the northbound lane. 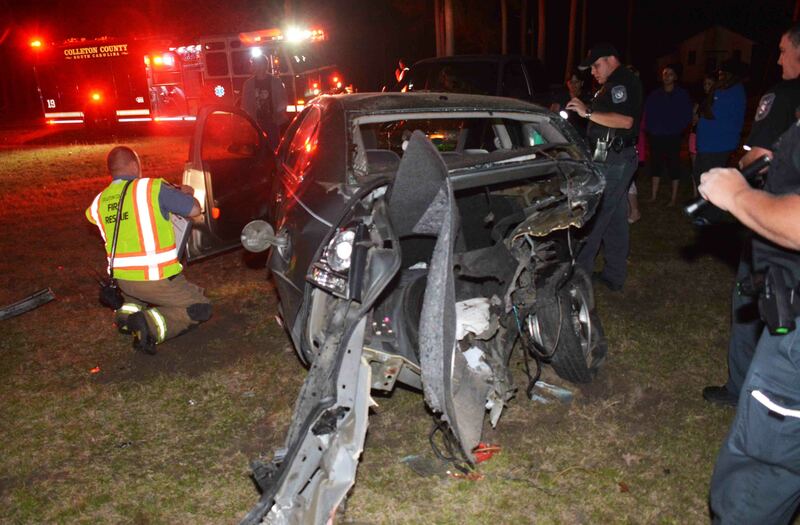 Both drivers were already out of the cars, each suffering from life threatening multiple traumatic injuries. Engine 19 requested a second ambulance, as Firefighter-Paramedics began treating the injured. Click here for more information. 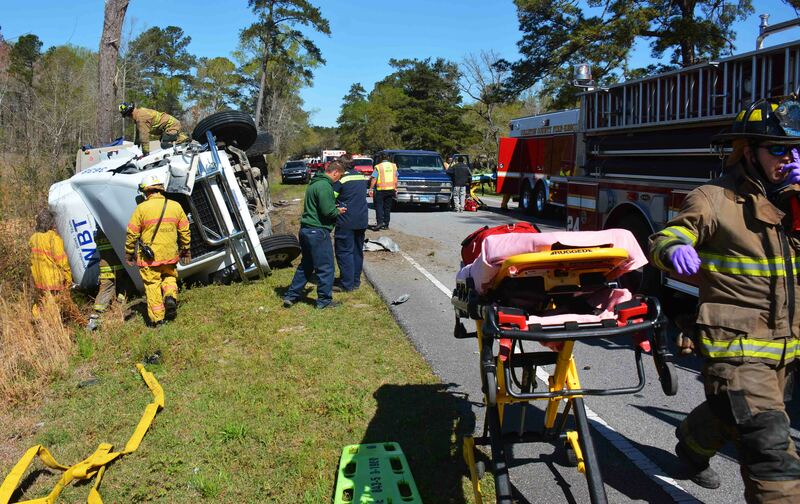 An adult male was transported to Colleton Medical Center with multiple non-life threatening injuries after he was extricated from his over-turned pickup truck Saturday afternoon 26-March. 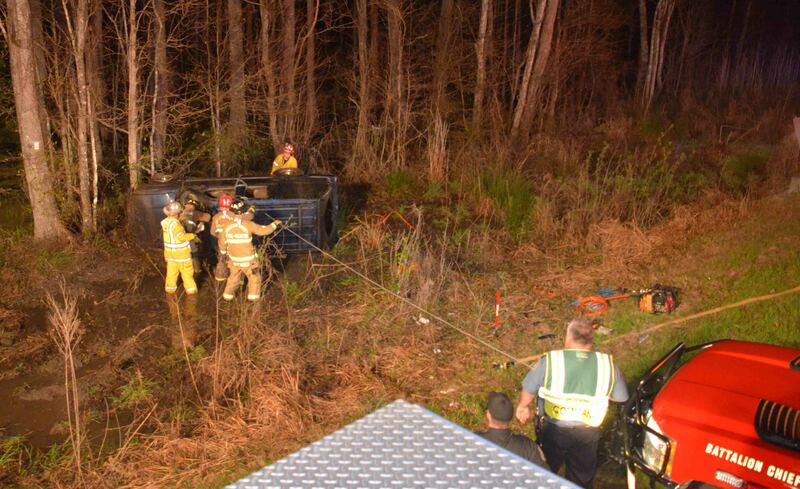 At 18:36, Fire-Rescue and Walterboro Fire Dept responded to the 900 block of South Jefferies Blvd for a small pickup truck that left the roadway and rolled over on the driver’s side in the Great Swamp Sanctuary. The male driver was trapped in the cab and covered with a large amount of debris from inside the truck. Click here for more information. At 11:13 a three vehicle accident was reported in the 6300 block of Charleston Hwy (SC Hwy 64) Monday 21-March. All vehicles were traveling east bound, when a loaded tractor trailer rear ended a full sized van, pushing it into a pickup truck that had stopped to turn left. The tractor trailer attempted to avoid the collision, but struck the rear corner of the van, before going into the ditch and overturning. The load of wood chips was spilled. All three drivers received non-life threatening injuries. Click here for more information. 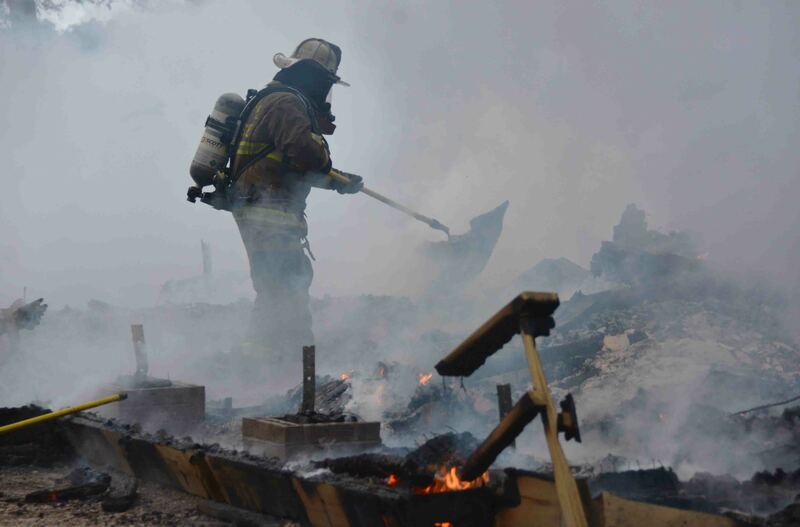 A Smoaks business was destroyed in an afternoon fire that spread from a previous yard debris fire Saturday afternoon 19-March. 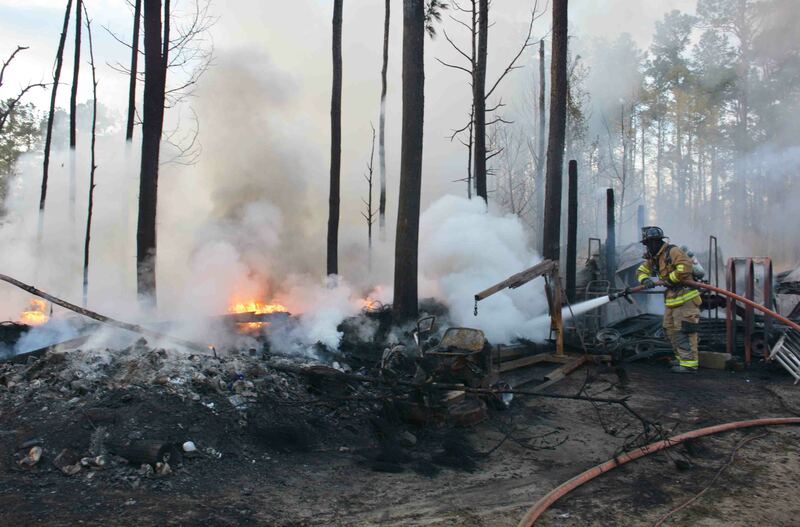 A 18:02, a caller reported a trash fire that had gotten out of control at 664 Buckhead Road in a rural community in northwestern Colleton County. The caller reported the fire had spread to a large pile of tires near a tire shop. Stations 7 and 18 responded to the incident. The caller called back 13 minutes later to report the building was now involved. Click here for more information. 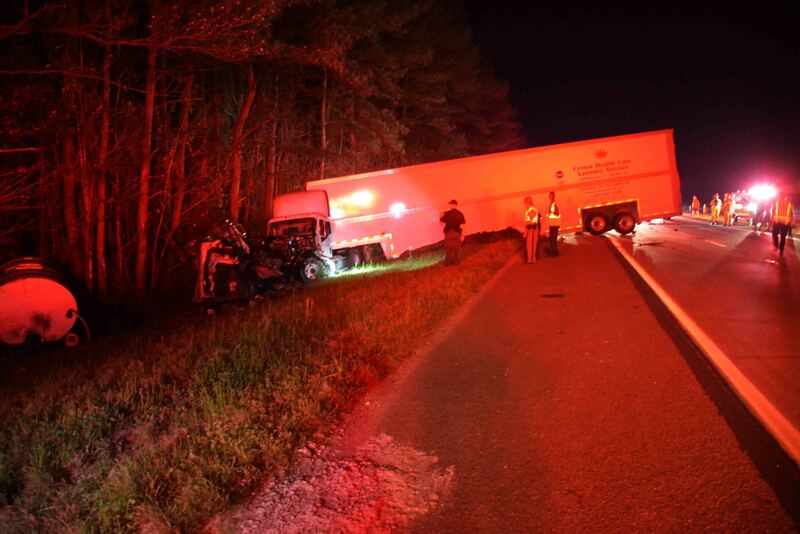 Two tractor trailers collided near the 48 mile marker on Interstate 95 Tuesday morning 15-March at 00:56. Both vehicles were traveling northbound when one truck ran into the back of the first vehicle. The collision caused heavy damage to both trucks as they went off of the right shoulder and stopped at the tree line. 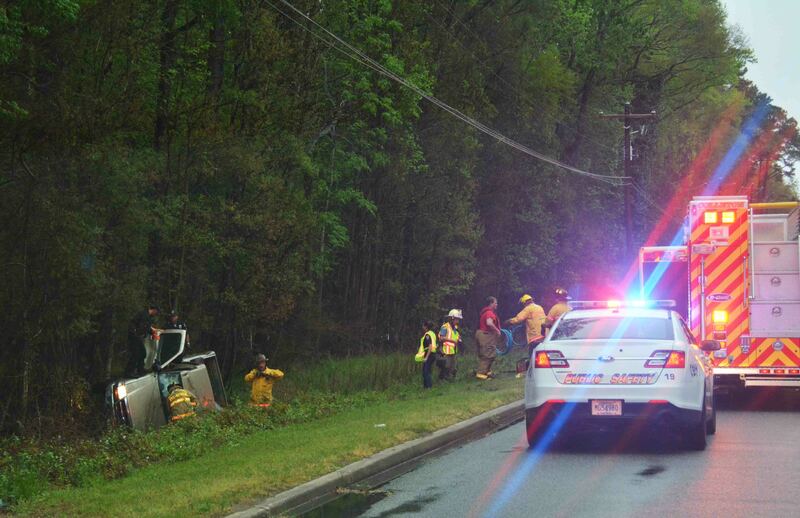 A large amount of oil and hydraulic fluid was spilled onto the roadway. The rear of one trailer, the oil and debris blocked both northbound lanes causing traffic to stop and back up for several miles. One truck caught fire after coming to rest against the other truck. Click here for more information. The former manager’s house at Ashepoo Plantation, 9314 Bennetts Point Road, was destroyed in an early morning fire Wednesday, 09-March. The residence was nearing completion after major renovations. When a worker arrived to work at 06:39, he found the one story dwelling was almost completely destroyed. Firefighters arrived a short time later to find a portion of one wall still standing, but it collapsed shortly after arrival. The building evidently had been burning unnoticed for some time. Click here for more information. Colleton County Fire-Rescue has openings for 2 (two) - Firefighter/Paramedics. Click here for more information. Fire-Rescue will be collecting funds through a boot drive at Wal-Mart, Tractor Supply and IGA from March 11 through March 20. Volunteers are needed to assist with the boot drive. If you are available on any of those days contact Paula at Headquarters (843) 539-1960 or Kristen Dias at Station # 1 (843) 538-7205. Fire-Rescue will be hosting a spaghetti dinner this Saturday-Sunday March 12th & 13th at Station 19 (1118 Thunderbolt Dr. Walterboro, SC). Tickets will be on sale this week at Headquarters (113 Mable T. Willis Blvd, Walterboro, SC). See Paula or Kristen to purchase your $8.00 tickets. All proceeds will go to benefit the Carolina Children’s Charity. The Spaghetti dinner will start at 17:30 (5:30 PM) both days and will include a side salad, spaghetti with meat sauce, garlic bread and your choice of a canned soda/tea. This event is open to all and donations are certainly welcome. To-Go boxes will be provided. Thanks to all! If you have any questions about this event please contact Kristen Dias at Station # 1. Three people were injured following a high speed two vehicle MVC in the 3300 block of Sidneys Road Monday evening 07-March at 20:01. A small car traveling south on Sidneys Road lost control and crossed into the oncoming lane striking a large delivery truck head-on. The car spun and went under the truck causing further damage to the small vehicle, then left the roadway and struck a guide wire before stopping in a yard. Click here for more information. A 62 year old man suffered non-life threatening injuries after he was injured in a two car collision on Hendersonville Highway (US Hwy 17-A) north of Jonesville Road Sunday morning 06-March. The accident was reported at 03:43 after a small northbound SUV crossed into the path of a southbound pickup truck. The pickup truck drove off of the roadway to avoid the crash but was struck in the left front. The SUV then drove under a boat trailer the pickup was pulling, dislodging the boat and knocking the axles from the trailer. Click here for more information. 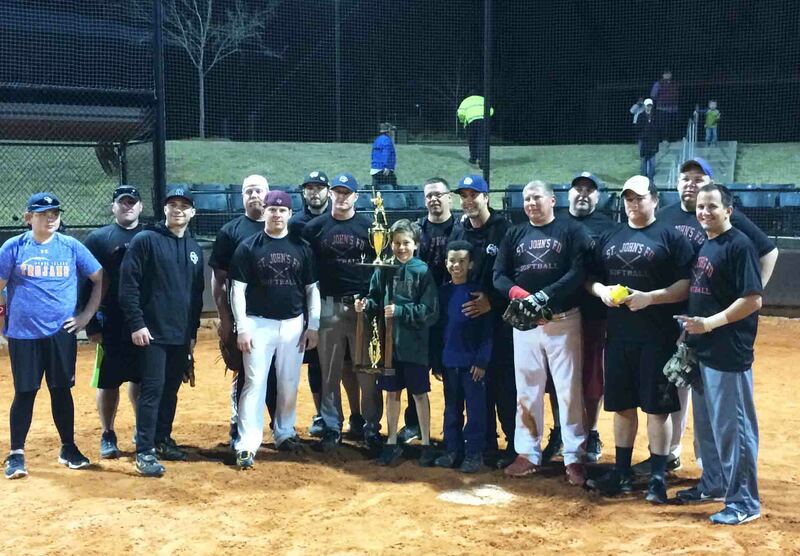 The Fifth Annual Emergency Services Softball Tournament was held Saturday, 05-March-2015 at the Colleton County Recreation Center. Ten teams participated and play through a beautiful day. The tournament began at 09:00 and ran until 20:00. St. John’s Fire Dept from Charleston County won the championship. A little over $3,200 was raised and will be split between the MUSC Burned Children's Fund and Carolina Children's Charity. Click here for more information. 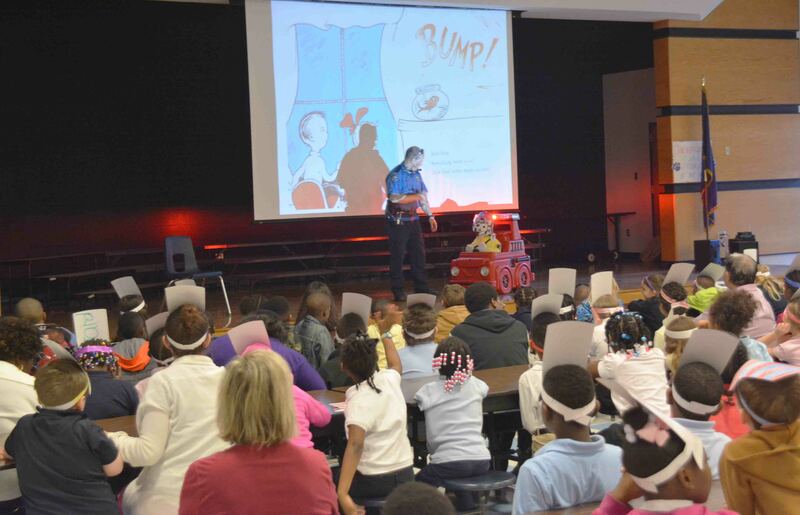 The annual Safe Kids Safety Fair was held at the National Guard Armory Friday and Saturday from 09:00 to 13:00. All third grade students were brought to the fair on Friday morning to rotate through the exhibits. It was open to the public on Saturday. The event is sponsored by the Safe Kids Coalition from Colleton Medical Center. 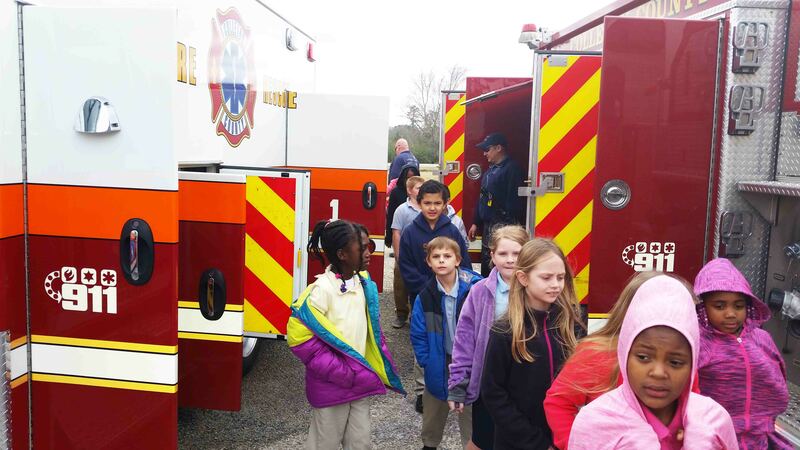 Displays included, Colleton County Fire-Rescue, Colleton Medical Center, School Bus Safety...click here for more information. Patches and Deputy Chief Greene read the Dr. Seuss classic, “The Cat in the Hat” to students at Forest Hills Elementary School and Colleton Prep Academy Wednesday morning 02-March. The event was held to celebrate the author, Theodor Seuss Geisel’s birthday and to encourage reading. Geisel was a poet, writer and cartoonist, who wrote many children’s books under the name Dr. Seuss. Personnel arrived at 08:30 to set up the large room for the 09:00 program. Click here for more information. The funeral arrangements for Battalion Chief Brent Dalton's father, James I. Dalton, will be as follows: The visitation will be Friday (3/4/2016) from 1400 to 1500 and the funeral will begin at 1500. Both will take place at Bullock's funeral home (1190 Wilson Hall Rd, Sumter, SC 29150). In lieu of flowers, the family has requested that a donation be made to either the VFW post in Sumter or the Shriner's Children's Hospital in Greenville, SC ( http://www.shrinershospitalsforchildren.org/Locations/greenville ). Please continue to keep Battalion Chief Dalton and his family in your thoughts and prayers. 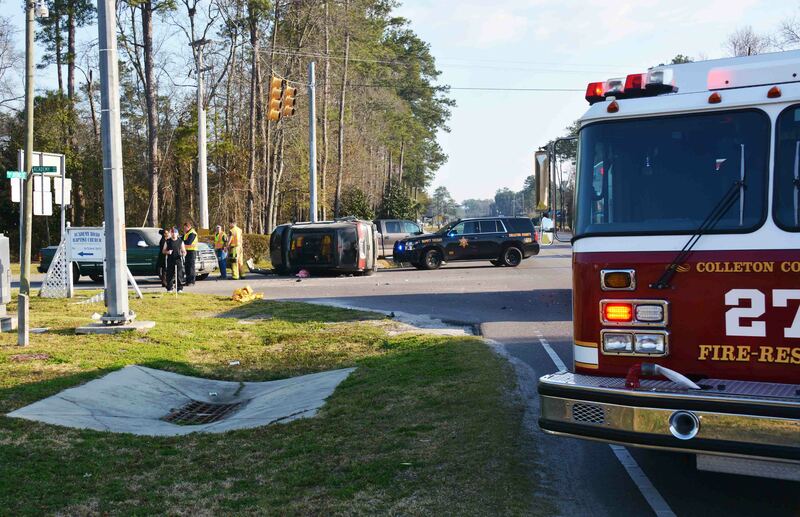 Five people were transported to Colleton Medical Center following a three car collision at the intersection of Jefferies Hwy (US Hwy 15) and Academy Road Tuesday morning 01-March at 08:22. A small car and a minivan collided in the intersection causing the minivan to overturn. The van then struck a pickup truck stopped at the traffic light. A woman and toddler in the van were trapped inside. Firefighter-Paramedics were able to remove the windshield to extricate the occupants. Click here for more information.